Most homeowners only have to consider repairing or replacing a roof once in their lives so getting to grips with what it involves and how much it should cost can be a challenge. This Guide To Roof Construction, spread into four parts, provides the basic information on flat and pitched roofs needed to understand what a roofing company is talking about, to help those unfamiliar with roof construction. Part 1 itself covers an overview of flat and pitched roofs. Part 2 – Pitched Roof Construction: covers pitched roof materials, basic pitched roof designs, cold and warm pitched roofs and pitched roof construction. A roof is primarily designed to keep out rain and snow including wind-driven spray from a building. It can also deny access to pests. In these day of energy conservation a roof can also contribute to preventing warmth being lost from a building. Where a roof has insulation as an integral part of its structure it is called a warm roof. Where the insulation is not included within its structure (maybe the insulation is laid on the ceiling of the floor below) then it is called a cold roof. 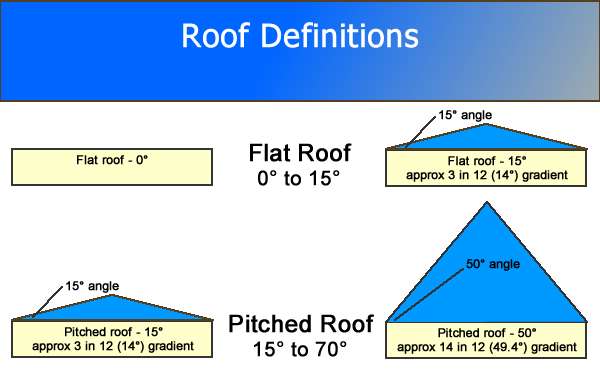 A flat roof is generally defined as having a pitch not greater than 15° to the horizontal. A truly flat roof would not allow rainwater to drain away so most flat roofs have a fall on them so that the rainwater naturally flows to collection points. Whilst you can have tiled roofs of 10-15° these are really flat roof construction with a cosmetic covering of tiles. Part of the choice of pitch is down to the architect and different period homes will have different pitches which are more “aesthetically pleasing” to the designer. Nathaniel Lloyd in his 1929 book, Building Craftsmanship In Brick And Tile And Stone Slates quoted Sir Edwin Lutyens describing 45° as “the ugly angle” for a roof pitch. As well as the visual appearance, the choice of roof pitch is influenced by the materials to be used and the resulting overlap required if roof tiles are used. As an example thatched roofs are often 45° or more whilst a slate tile roof can be much flatter at say a 35° pitch if desired. In areas of high snowfall then the roof pitch can be much greater, to allow the snow to fall off the roof rather than settle and build up on the roof. Roofs with pitches of 10° to 20° are often called low pitched roofs and special considerations need to be made, particularly on the overlap between tiles to avoid water being blown into the roof by the wind. Read part 2 – Pitched Roof Construction. Part 2 of this guide covers pitched roof materials, basic pitched roof designs, cold and warm pitched roofs and pitched roof construction. Flat Roofs are structurally more attractive for larger, commercial building.They increase design flexibility and functionality, often making it easier to install heating and cooling equipment to the attic or roof area. Not a respectable picture of a typical roof construction in site. Interesting article. The name for bonnet tiles, along with a car’s bonnet, are probably both inspired by the headgear once worn by women.